FILE - Chadian President Idriss Deby attends a meeting with EU and African leaders to discuss how to ease the European Union's migrant crisis, at the Elysee Palace in Paris, on Aug. 28, 2017. This week, Chad’s parliament voted to introduce a new constitution that will allow two more terms for President Idriss Deby, who has led the country since 1990. On May 17, Burundians will vote on a constitutional amendment that would enable President Pierre Nkurunziza, president since 2005, to stay in office an additional 16 years. And in the Democratic Republic of Congo, a worsening humanitarian crisis unfolds while President Joseph Kabila refuses to step down, despite reaching the end of his mandated time in office nearly 18 months ago. 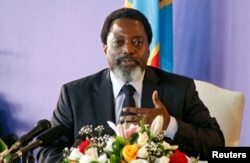 FILE - Democratic Republic of Congo's President Joseph Kabila holds a news conference at the State House in Kinshasa, Democratic Republic of Congo, Jan. 26, 2018. 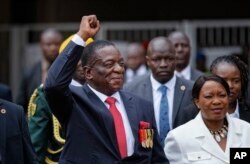 An analysis by the Africa Center for Strategic Studies (ACSS) earlier this year found that less than 40 percent of countries have enforced constitutional term limits, and leaders in just 15 countries have stepped down after two terms. An author of that study says the consequences can be severe. “It leaves fewer options of using the political process to make those changes and leads to justification for violent alternative measures to be taken,” he added. The connection between term limits and conflict reflects the source of political violence in Africa. “Most of the conflicts in Africa are the result of political crises,” Siegle said. Those include conflicts in the DRC, where Kabila has refused to organize new elections, and in South Sudan, where President Salva Kiir has clung to power in the face of a violent uprising. FILE - Emmerson Mnangagwa, center, and his wife, Auxillia, right, arrive at the presidential inauguration ceremony in Harare, Zimbabwe, Nov. 24, 2017. Africa has seen a succession of historic transfers of power in recent months, including handovers in Angola, Gambia and Zimbabwe. But none of those countries has had leaders step down at the end of a mandated term. In Angola, president Jose Eduardo Santos had been in power 38 years; in Zimbabwe, president Robert Mugabe had ruled for 37. Two of those men’s contemporaries remain in office: Teodoro Obiang Nguema of Equatorial Guinea, currently in his 39th year as president, and Paul Biya of Cameroon, in power 35 years. 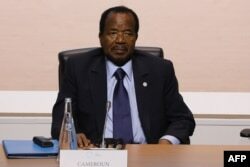 FILE - Cameroon's President Paul Biya attends a session of the One Planet Summit on Dec. 12, 2017, at La Seine Musicale venue on l'ile Seguin in Boulogne-Billancourt, west of Paris. In the wake of the Cold War, in the 1990s, a global democratic reform movement swept through Africa, Siegle said, leading to the dismantling of the one-party states that were previously enshrined in constitutions and the formation of opposition groups with legal backing. Over time, new systems of governance resulted in elections and the emergence of term limits. Most African leaders who stepped down at the end of their terms did so in the early 2000s. Tanzania was at the forefront of political reforms. Ali Hassan Mwinyi, the country’s second president, stepped down in 1995, after 10 years in power. He was the first African president to fulfill two terms and step down. “There was a legacy of the rule of law in Tanzania that you didn’t see in some of the other countries,” Siegle said. Tanzania’s first president, Julius Nyerere, paved the way for Mwinyi’s two-term presidency, according to Siegle. Although Nyerere led for more than 20 years, he also oversaw the transition to a multi-party state. “Nelson Mandela, I think, we could put in that same category. He isn’t on our list because he didn’t actually serve two terms.” Mandela stepped down in 1999, after serving one term. “Once Mandela set the precedent, nobody else was going to stay on” past their mandates, Siegle said. In countries that observe term limits, press freedoms are much greater, based on 2018 rankings by Reporters Without Borders. Countries with term limits have an average press freedom index of 28. For countries without term limits, with leaders who have not reached their limits, or with limits that have been modified or removed, the average index is 45. Higher scores are worse on RSF’s scale, with the worst-possible score being 100. Siegle warned against equating consistent leadership with stability. Indefinite rule, he said, leads to conflict, economic problems and development issues more often than not. “It’s a misnomer that autocracy leads to stability,” he said. Governmental and societal institutions become weaker, he added, eroding the checks and balances necessary for a robust political system. Looking ahead, Siegle foresees that all African nations will have the ability to institute term limits, and all leaders will face increasing pressure to do so. Some pressure to step down is even coming from former leaders. Hailemariam Desalegn, the former prime minister of Ethiopia, called upon South Sudan’s Salva Kiir to step down, characterizing the conflict in South Sudan as a failure of leadership. “Immediately after my resignation, I asked them, please would you resign because you failed to resolve this problem in South Sudan,” he said in response to a question from Mo Ibrahim, a Sudanese-British billionaire businessman who hosted a forum in Kigali, Rwanda, last month. Ibrahim’s foundation awards a one-time $5 million payment, and a $200,000 annual payout for life, to African heads of state who uphold the promise to transfer power peacefully. “Leaders should come to their senses, to their mind, and they should somehow leave so that they can give to the new leadership, new blood leadership, who can take the country to the next level,” Desalegn added.